I came late to Jack Ryan. Oh, I saw "Red October" when it first hit video many years ago, and it was great, but that was the extent of my Ryaning until Paramount released the boxed Blu-ray set. But I came to appreciate the Tom Clancy character, though I have no idea how close the movies' version(s) of the character are to his creation. I came to appreciate Clancy, too, through other things he did and from what I learned about him. The "original" movies were spotty but they were all worth seeing as well. They appear to have been moneymakers, too, because there's a new one on Blu-ray and it's also worth seeing. Not a modern classic, but definitely worth a view. Why bring Jack back from the film vaults? Well, this is the studio that rebooted Star Trek so successfully - let alone has lived well off it for nearly half a century - so another such birthing shouldn't really be a surprise. And just in case we don't get that this is a reboot, it has the same actor in the lead role of both movies. Like Star Trek, it's also an "origin" story, of a young Jack Ryan, how he came to be and how his relationship with wife Cathy was built. I like Chris Pine as Kirk but that's all I'd seen him in before he took over the Baldwin/Ford/Affleck role. And he gets to flex some different acting muscles in this one, playing a character very far removed from the blustery Star Fleet captain; his Ryan shows a quite restrained Pine, though fortunately it doesn't look like it took director Kenneth Branagh manacles to get it from him. This film isn't based on a Clancy novel so it's basically a clean sheet. 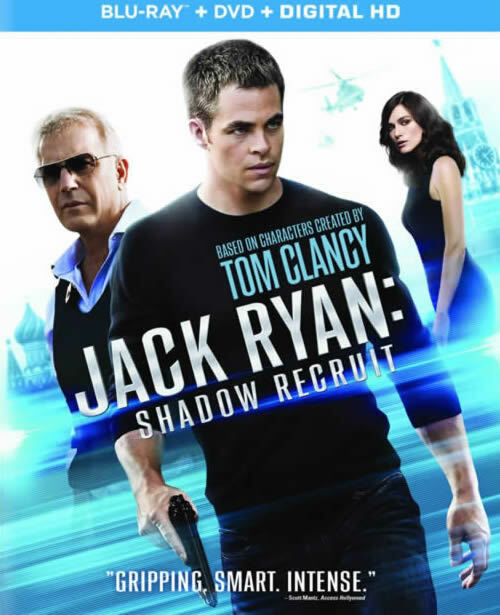 But the formula is there; war hero and all around decent human being Jack Ryan is recruited into the CIA, supposedly for his abilities as an auditor. He has to start working in the bank, poring over the accounts and look for clues that could help prevent a terrorist attack. Naturally, he finds something amiss and after he reports it he finds something else - himself in Russia, poking into the affairs of a tycoon there (director Branagh). It's neat to see Ryan's metamorphosis from analyst to active agent, and the movie moves along nicely. There's plenty of action and it's done well. Kenneth Branagh makes a great villain, and Keira Knightley does a decent job as Cathy. Kevin Costner, as Ryan's CIA mentor, is okay, but he just doesn't seem to have the presence to be a male authority figure. I noted the same thing in "Man of Steel," where he played Jonathan Kent and couldn't hold a candle to Glenn Ford's earlier interpretation. Paramount's combo pack of the movie (Blu-ray, DVD and Digital) is very nice. The 1080p picture is clear and clean and colorful and satisfying, and the DTS-HD audio track (it's in 7.1 but we listened in 5.1) is pretty well flawless. Your home theater will get a nice workout. They've put in quite a few extras, too. You get a commentary by Kenneth Branagh and producer Lorenzo di Bonaventura, and it's fascinating. There are also deleted and extended scenes with optional commentary, and "Jack Ryan: the smartest guy in the room" is a just shy of 15 minute featurette that takes us down memory lane via all the Jack Ryan movies. There are a few other short featurettes as well. Paramount is also going to the well again with a rerelease of "How to train your dragon," Dreamworks' animated flick that was so successful it spawned a sequel due this year. This is the original, and if you haven't seen it yet (I must admit I hadn't) you have a chance to bathe in the film's universe in preparation for the new one. Is that cynical? Hell, it's the free market. Besides, without this rerelease I wouldn't have had a chance to see the movie before the sequel, either! Gee, I miss video stores! Anyway, How to train your dragon is, not surprisingly, a fantasy. Our heroes are Vikings, though some sound decidedly Scot, and our chief hero is young Hiccup, who in a bid to impress Daddy invents a device meant to capture the dragons which nearly constantly lay waste to their town. It works, and he snags a Night Fury, but of course instead of parading its head on a pike in front of the other dragons as a warning to bugger off and leave them alone lest they be next, he befriends the crispy critter and even helps it fly again. It sounds predictable and it is, but it's entertaining enough and the animation is first rate. It's a pretty good ride, all said. It's a pretty good Blu-ray, too. We watched Paramount's disc on a 55 inch LG 4K TV and it looked fantastic. Ditto the Dolby TrueHD audio. Well, the audio didn' tlook fantastic, of course, but it sounded so. This shouldn't be surprising; CG films usually look and sound great and they're usually fun as well, and surely that's one of the reasons we put up with so many very ordinary ones. This one's definitely on the higher side of the bell curve, though not near the Movie Mensa level like The Incredibles. Of course few films are. Add in a decent set of extras and you have a fun package for reveling in, or showing off, your home theater.